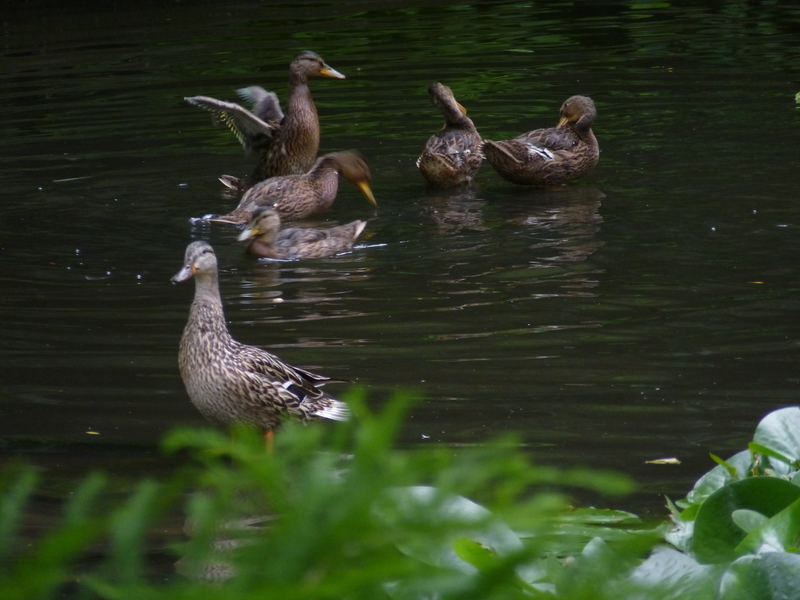 There may not be duck reports for several days: although I will continue feeding them, I won’t have time to post as I’ll be entertaining visitors. We shall see. In the meantime, the little ones are getting big and ducklike, and even their wings seem to get bigger every day. The postprandial procession this morning: Honey is usually in the lead but this time she’s bringing up the rear. Eight—count them, eight—ducklings. Look how big their wings are! And they seem to be flapping them more often, too. On a day not too far away, they’ll flap them and take off. This entry was written by whyevolutionistrue and posted on June 27, 2018 at 2:45 pm and filed under ducklings, ducks. Bookmark the permalink. Follow any comments here with the RSS feed for this post. Both comments and trackbacks are currently closed. Wait until they all come back next year to raise their own families. Not gonna happen. Didn’t happen last year! The same with a pair of white storks I observe: they bring up one or two chicks every summer, but there is never competition around the nest in the next spring, always one pair comes and settles. You have to get ornithologists to ring them… but I suppose that is hard with such big birds without hurting them? I guess so. I used to go birding with members of our society for protection of birds, and nobody ever attempted to ring a stork, or even discussed it! This was a decade ago, and the pair (well, a pair) has kept coming ever since every spring and hatched young storks. What an interesting nest! Thank you for sharing! They look like they might be about the size of a heron. 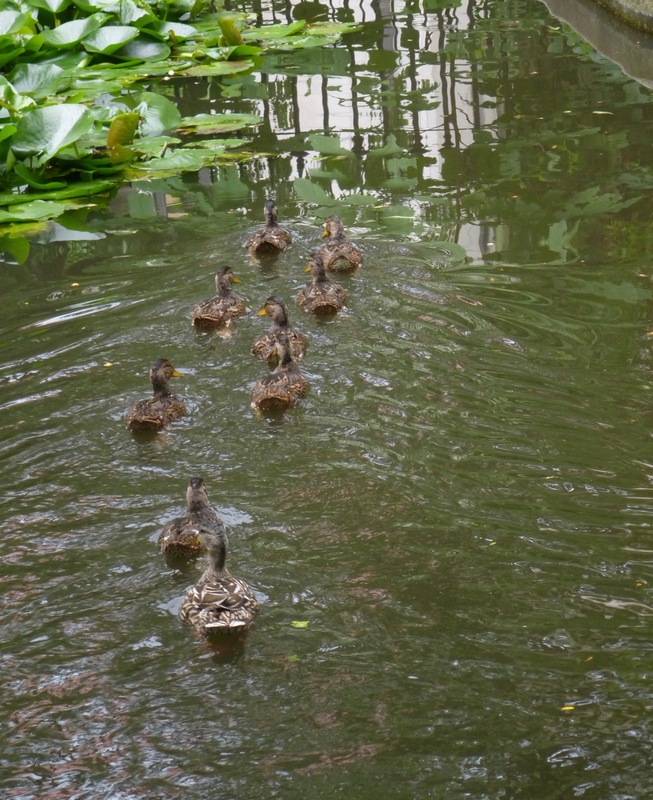 What kind of visitors are they that wouldn’t like a stroll down to feed the beautiful ducks and ducklings? I would be there with my own corn! A most welcome respite from having the calamities of the day shoved in one’s face. The photo of the flotilla of little ones sailing toward the lily pads reminds me of little children I sometimes see on walking field trips from school. They’re usually paired up two-by two and are instructed to hold hands,but soon the orderly pairs uncouple,the line gets ragged and the teacher says something like “Girls and boys, hold your partner’s hand and walk two abreast, don’t run, don’t jump around.” I think Honey’s given up with that sort of thing. Wow!! So hard to believe how much they’ve grown!! After 3 days will we even be able to tell them apart from Honey! I’m exaggerating, but not a lot. I saw this on a local news site in Japan, maybe your ducks might likes some watermelon? Husband and I began re-watching the Sorpranos series last night. Must say, I thought of you during that first episode! Hope you’ve seen the first episode, even if watching the series doesn’t interest you. Have you been able to single out any duckling(s) from the others yet? You are one proud papa!